Who will you be during Rio Carnival? Apart from being the biggest event, the Rio Carnival is certainly the most colorful, with costumes and elaborate floats that proudly display a samba school’s colors. If you think of painting a picture of the Carnival, finding the defined colors would be a seemingly daunting task. The same applies to carnival costumes when it is a matter of choosing one for your big night at the Sambadrome. Parade with a real Samba Schools at the main Sambadrome, Your costume is your access to the Rio Samba Carnival parade. You may buy your Costume For The 2019 Rio Carnival Celebration Right Here. Carnival costume orders are currently being accepted and you have until December to decide what your samba school will be. 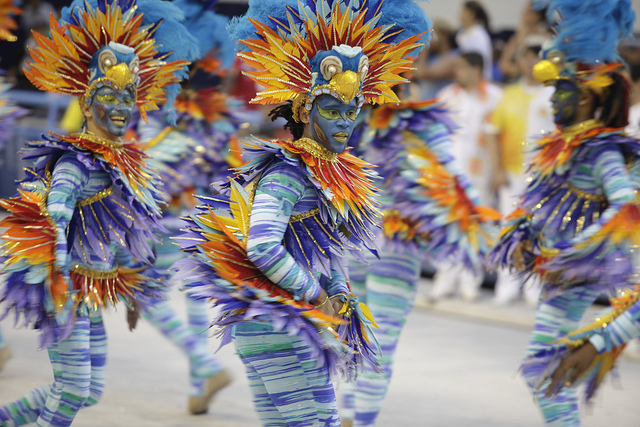 Browse our collection of available costumes by samba school, parading date, price and type. Remember that Carnival Costumes for Rio parades are made to order. Have Fun! 1) Costumes orders for Rio de Janeiro Carnival Parade are being accepted while supplies last. The window is normally from now to mid December. 2) "VIP Service" means Transfer and Guide assistance are included in your package. That's very convenient, but not the only option. 3) You can book any costume available on our site and go to the Sambadrome on your own. Subway is a safe and great idea, too. 4) Costumes have to be picked up in Copacabana on Friday March 01st, Saturday March 02nd or Sunday March 03rd, 2019, exclusively, from 10 AM to 5 PM. We will not deliver costumes to the hotels or any address in Rio. The transit in the city is chaotic with so many bands and blocos taking the streets. We used to deliver costumes but we found out that clients used to wait for a long time in their hotels/residences missing out the beaches and the carnival day attractions. Picking your costume at our offices will be much more convenient for you as you gain time to enjoy the beach and get that perfect tan for the big night. Get escorted all the way with our experienced English speaking staff.For your comfort and convenience our VIP Service Costume Packages will assure you don't miss anything. Our English speaking guides will lead the way from the time you get picked up to the end of the parade.All VIP Service costume packages include round trip transportation from the Rio Othon Palace Hotel in Copacabana to the parading ground - the Sambadrome - at parading day. Our English speaking guides will be with you before and during the Rio parade, making sure you don't miss anything. All you have to do is to smile to the 80,000 people in the bleachers, not to mention millions more on TV around the world. Costume Packages available for selected ground costumes for Friday and Saturday March 01st and 02nd, 2019 with the Access Group - more affordable - and both days of Special Group on March 03rd and 04th, 2019.Check the carnival costumes with VIP Services right here. Look for the starts and the indication of VIP Services being offered until December. Your choice of costume depends on the samba school you are to parade with. Costumes can be ordered online. All you need to do is send in your correct measurements so that your costume will be ready in time for the Carnival. Rio.com offers a great selection of costumes that are tailored to match the samba school’s requirements perfectly. This is the best way to assure your costume is the correct size and in pristine conditions. It is also quite effortless as your costume will be delivered directly to your hotel.The price varies according to the design, the day you want to parade, as well as the school’s popularity in the competition. Ground wing costumes cost around US$ 400 to US$ 700. They must be ordered by the middle of December. These prices usually include transportation from Copacabana to the Sambadrome and back along with the assistance of a guide. Rio tends to get hot during Carnival time; therefore, the costumes are designed to keep the wearer as cool as possible. If you don’t plan to join a samba school at the Sambadrome, you can join the many of the street parades as well. The colorful garb is hard to emulate so you will need to buy your costume from the right source. There are so many street parades in the city that they are impossible to avoid so you might as well join the party and have some fun. The larger parades can have audiences of as many as 1 million people. This is a great rid to rub elbows with spectators from all over the world. If you aren’t joining a samba school but want to soak in all the excitement anyway, there are costumes like the Brazilian Warrior and Midnight Robber that are popular with revelers. The Midnight Robber costume consists of a black satin shirt, pants, a flowing black cape with a skull and cross bones, along with the broad, black brimmed hat. To make sure your costume is safe you can have it delivered to your hotel or any other address in Rio once you reach there in time for the Carnival. For some more Carnival madness, you can always choose a clown’s costume. If you are a first time visitor to the Carnival, dressing up as a clown may be a good idea. Clowns have their own dances and acts to keep the crowd entertained. If you get the time, try your hand at juggling as well. Those joining a samba school must be careful not to wear the costume prior to the parade so that it is kept in perfect condition. Judges award points for costumes, and you wouldn’t want to let your team down by wearing a damaged costume. Make sure you reach the Sambadrome two hours in advance and report to the president of your wing. If any portion of your costume is torn or missing advise the Wing President. He will be sure to have it repaired before the start of your parade.This is the time you get to warm up before your final strut down the runway. There is no doubt that the Carnival is the most colorful and creative event. This is your chance to enjoy entertainment at its best. The only thing is to make sure you head for the Sambadrome in a costume befitting the Carnival.Parade with a real Samba Schools at the main Sambadrome, Your costume is your access to the Rio Samba Carnival parade. You may buy your Costume For The 2019 Rio Carnival celebration right here until December. Remember that Carnival Costumes for Rio parades are made to order.